Remove the heads from the prawns, and using a sharp knife, cut through the centre of the prawns lengthways to form two halves, leaving the tails and shells intact. 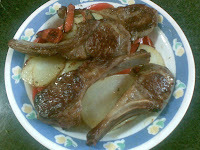 Place the olive oil, 2 chopped garlic cloves, sweet chili sauce and lime juice in a large bowl, and mix together well. Add the prawns, toss to coat, and marinate for 30 minutes. Heat a barbecue or chargrill plate until hot. 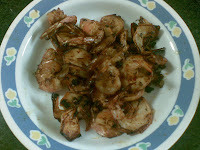 Drain the prawns and cook cut-side down first, brushing with the marinade, for 1-2 minutes each side, or until cooked. Divide the lettuce among four serving plates, place the prawns on top. Season and serve. After our Friday night badminton, GF and I drove by London Road to look at this cheap house for sale. No wonder it's a bargain - right beside the property is a distribution substation. Bah! Anyway, since we're already in the area, we had dinner at Dooleys Lidcombe Catholic Club. The bistro is a really nice place to hang around in - live entertainment, bright lighting, not too noisy, comfortable seats. Took about an hour before we got our food though. In celebration of the Mid-Autumn Festival (a.k.a. Mooncake Festival), the Chinese Garden of Friendship in Darling Harbour is staging a lights and sound show telling the story of how Chang'e ended up on the moon and became the Moon Goddess. Tickets cost $10 for adults with children under 12 free. GF and I met up after work and got to the Chinese Garden around 6:30pm, which gives us half an hour before the show commences. The Garden is not as big as I imagined. Some rock formations, a few trees and shrubs, a big pond, a few pavilions and connecting walkways. We found a nice vantage point, but come showtime, people starting sitting just about anywhere they want, so our view was a bit compromised. Prior to the show, there was a lion dance performance, with the lions meandering through the audience. The voiceover was a bit blurred, but based on the actions of the costumed actors, this is how I understood the story. There's the emperor, his wife and his daughter Chang'e. At that time, there were nine suns in the sky, which is not an ideal situation. Along came Houyi the archer, who shot down the suns, obviously leaving one. Out of gratitude, the emperor gave him Chang'e as his wife. The emperor also gave Houyi a pill that gives eternal life. One day, while frolicking in the gardens, Chang'e found the pill hidden in the rocks. Curious, she ate the pill. It made her lighter than air, and she floated up into the heavens, where she eventually settled on the moon. As a finale, the audience is treated to a big white floating balloon representing the moon and fires and pyrotechnics lighting up the sky. After the show, everyone was given a small mooncake to sample. Dinner is seafood combination chow mien and pork ribs Pekinese style and rice at Super Bowl.